Which mutual fund is best for investment in 2017? Which mutual funds will give best return in 2017? I am sure you must be searching for the answer to these questions. Well, it is very easy to answer these questions provided you follow right selection method for the mutual funds. Remember mutual fund selection is not a rocket science. Anyone can find a good mutual fund for investment provided he/she follows right selection methodology. The year 2016 is about to end and like every year this year also I will be recommending best mutual funds SIP for 2017. I am sure that you must have taken benefit from Top 20 Best Mutual Funds article written by me. All the mutual funds mentioned in the article are doing extremely well and giving very good returns to the investor. Today I am here with Top 20 Best performing mutual funds SIP to Invest in India for 2017. Type of Funds – The first parameter for the shortlisting is a type of fund. I have shortlisted all types of mutual funds like large cap, small cap & mid cap, tax saving, debt and balance funds. Fund Rating – The second parameter for short listing the mutual fund is rating. I have considered mutual funds rating given by CRISIL & Value Research. The selected funds are with higher CRISIL ranking 4 Star or above. Fund Performance – All funds have been shortlisted based on fund performance. I have considered 3-5 years tenure for all the funds. Fund Holdings – Another parameter for the short listing of Best Mutual fund is fund holding. Most of the funds are holding blue chip stocks or making an investment in stocks which are likely to appreciate in future. Fund Manger Expertise and Experience – A Fund manager is the person who makes the decision about buying, selling, or holding the stock in the mutual funds. The returns of the fund depend on the decision taken by the fund manager and its expertise. 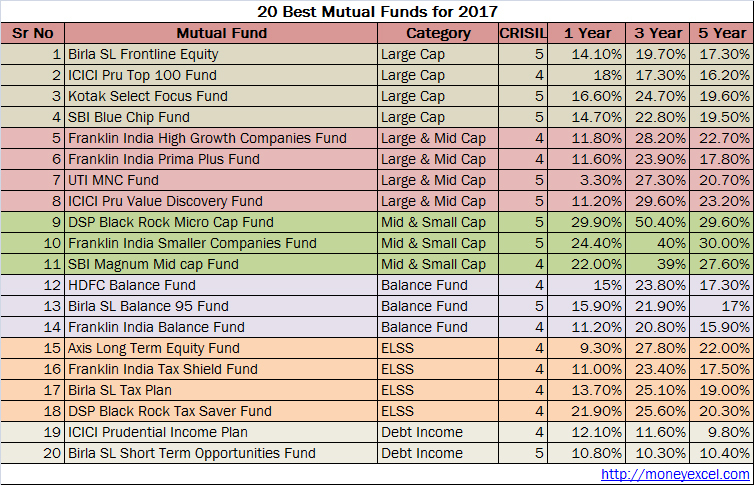 Based on the above parameters the Best Mutual Funds SIP to Invest for 2017 are given below. Birla Sunlife Frontline Equity mutual fund is large cap fund. This fund has given very good performance historically. In last 3 years fund has given 19.7% return to the investor. This fund is managed by an experienced fund manager. The asset size of this fund is 13000 Cr. CRISIL Rating is 5. You can invest in Birla SL Frontline Equity mutual funds for 2017. ICICI Pru Top 100 Fund is second large cap fund recommendation for 2017. The average return of this fund in last five years is 17%. This fund has invested in good blue chip stocks. Asset size of this fund is 1400 Cr. This fund is high-risk high-return fund. CRISIL Rating of this fund is 4. Kotak Select Focus Fund is best mutual funds in large cap category.The expense ratio of this fund is very low (2%).Asset under management is 6300 Cr. Stock holding pattern and YOY consistent return are plus points for this fund. This is pure equity fund with 93% holding in the equity market. SBIBluechip Fund is next in line of the best mutual fund for 2017. CRISIL Rating of this fund is 5. The expense ratio of this fund is very low. AUM of this fund is 8846 Cr. The fund manager of this fund is managed by an experienced fund manager. This fund is one of the oldest funds. Historically this funds has given very good returns. Franklin India High Growth Companies Fund is multi-cap fund managed by three fund managers. The AUM of this fund is 5042 Cr. CRISIL Rating of this fund is 4. This fund has given a return in the range of 20-30% at a long run. This fund has made investment largely in banking, automobile, and infrastructure sector. You can invest in this fund for 2017. Franklin India Prima Plus Fund is next recommended multi-cap fund. CRISIL rating of this fund is 4. This fund is managing asset worth 9200 Cr. This fund is managed by an experienced fund manager and it is one of the oldest funds in this category. UTI MNC Fund is next fund in the category of multi-cap fund. CRISIL rating of this fund is 5. This fund has given very good performance in past. It is managed by an experienced fund manager. The asset managed by this fund is Rs. 2057 Cr. Last year performance of this fund was average but it is expected to improve in 2017. ICICI Pru Value Discovery Fund is one of the best funds for investment in 2017. This fund has given very good return historically. The asset managed by this fund is Rs.14979 Cr. This fund has invested 92% in equity sector and 8% in debt. Finance, Technology, and Infrastructure are a major holding of this fund. DSP Black Rock Micro Cap Fund is best Mid & Small-cap fund for investment in 2017. The average return of this fund for last five years is 30%. Major holding of this fund is chemical, textile, and engineering sector. CRISIL Rating of this fund is 5. You can invest in this fund for 2017. Franklin India Smaller Companies Fund is topmost fund under mid & small cap category. This fund has given very good return to the investor in past. The major holding of this fund is in finance, engineering, and chemical sector. You can invest in this fund for the long-term. SBI Magnum Mid cap Fund is one of the top mid-cap funds. CRISIL rating of this fund is 4. The expense ratio of this fund is very low. Finance, health care, and Engineering are the top sectors where this fund is investing money. This fund has given a very good return in past. HDFC Balance Fund is first balance fund recommended for 2017. The asset managed by this fund is Rs. 7391 Cr. The expense ratio of this fund is 1.99% which is very low. This fund is managed by the experienced fund manager. In past, this fund has given an average return in the range of 15%. Birla Sun Life Balance 95 Fund is one of the best performing funds. CRISIL rating of this fund is 5. Finance, automobile, and health care are major focus area of this fund. This fund has 70% equity holding and 30% debt holding. The next fund under balance category is Franklin India Balance Fund. CRISIL rating of this fund is 4. This fund is managed by an experienced fund manager. A performance history of this fund is very good. This fund has 65% equity holding and 31% debt holding. Like last year this year also Axis Long Term Equity Fund is first ELSS fund for investment. The asset managed by this fund is Rs.10465 Cr. This fund has given very good return historically and beat peers and as well as Nifty 50 index. CRISIL rating of this fund is 4. You can invest in this fund for tax saving purpose. Franklin India Tax Shield Fund is next ELSS fund for investment. The prime focus of this fund is finance, automobile, and technology sector. CRISIL rating of this fund is 4.This fund has given historically given very good return to the investor. Birla Sun Life Tax Plan is a good fund for tax saving purpose. The expense ratio of this fund is high, however, this fund has given a very good return in the past. CRISIL rating of this fund is 4. This fund is investing 97% fund in equity sector. DSP Black Rock Tax Saver Fund is ELSS for investment in 2017. This fund has given average 20% return to the investor in past 5 years. The asset managed by this fund is Rs.1435 Cr. CRISIL rating of this fund is 4. ICICI Prudential Income Plan is one of the best funds in debt category. This fund has given consistent 10% return in past 5 years. It is medium risk fund with very low expense ratio 1.8%. The next best fund in debt category is Birla Sun Life Short Term Opportunities Fund. This fund has also given 10% consistent return in last 5 years. CRISIL rating of this fund is 5. The expense ratio of this fund is very low 1.39%. If you are risk adverse investor you can invest in this fund. Disclosure – I am already holding and making investment via SIP route in Franklin India Smaller companies fund, HDFC Balance Fund, SBI Magnum Mid Cap Fund and ICICI Pru Value Discovery fund. I am planing to take SBI Life – Smart Scholar ULIP plan for my son (6 months old).I am planing to pay 1lakh per year for 5 years. I am expecting maturity amount of around 22lakh after 18 years (for education).In this plan I have to select one of the below fund. Which fund I should select ? Everybody is selecting Bond Fund I don’t know why ? Is it a good plan ? or Should I go with a SIP or any mutual fund plan to achieve my goal? I just read some of your blogs and indeed these are very informative and your reply to every question is much appreciable. 1. I have some Rs. 500,000/- and I want to put it to 4-5 MF’s Lumpsum for long term (approx. 10 Years). I suggest you to go for (1)SBI Bluechip Fund (2)Franklin India High Growth Companies Fund or (3)ICICI Pru Value Discovery Fund. It is one of the best article I have read. Very informative.